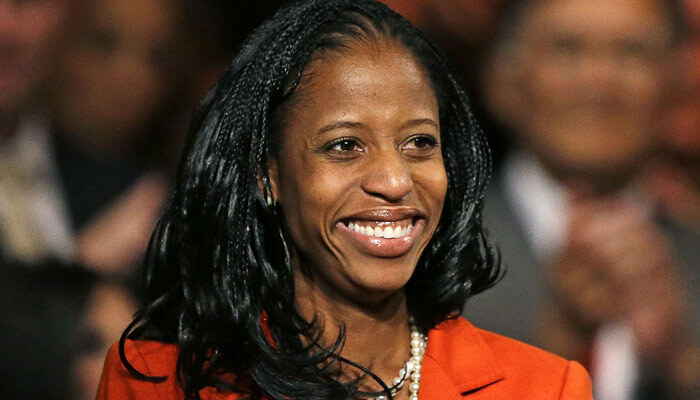 Mia Love is the first-ever black Republican congresswoman. She’s also a member of The Church of Jesus Christ of Latter-day Saints. Mia spoke at the 2012 Republican National Convention when she was still the mayor of Saratoga Springs, Utah. Saratoga Springs is a town in Utah Valley, northern Utah, on the north edge of Utah Lake. Ludmya “Mia” Bourdeau Love was born in 1975 in Brooklyn, New York. Most of her early years, however, were spent in Connecticut. Her parents immigrated from Haiti in 1973. They raised Mia to give back to the United States and to people in general, telling her not to expect to receive any handouts. She graduated from the University of Hartford in Fine Arts. She worked at the Sento Corp. and the Ecopass Corporation. She was also a flight attendant with Continental Airlines (Wikipedia) and has even been a fitness instructor. Mia’s husband, Jason Love, served a Mormon mission in Connecticut. Mia converted to the LDS Church in college, went to Utah, and they married there. They have lived in Saratoga Springs since 1997. Jason is white, so Mia left Catholicism and an east-coast culture to live in a mixed-race marriage in a state where only 1% of the population is Black. She says she has felt only love and acceptance in Utah. In 2003, Love won a seat on the Saratoga Springs City Council, becoming the first female Haitian-American elected official in Utah County, Utah; she took office in January 2004. After six years on the Council, she was elected Mayor. In 1997 Saratoga Springs had a population of 1,000. But by 2008, the population was 18,000. Love worked with other city council members to cut expenses, reducing the city’s shortfall during the economic downturn from $3.5 million to $779,000. Saratoga Springs now has the highest possible bond rating for a city of its size: AA+ (Wikipedia). As a wife and mother of three children, I believe the best hope for our future is to focus on fiscal discipline, limited government and personal responsibility. These three core principles drive economic growth and opportunity. She ran in the 4th Congressional District, created after the 2010 Census. She garnered 70% of the vote to earn the nomination. Nationally, Love has received campaign support from House Majority Leader Eric Cantor, House Budget Committee Chairman Paul Ryan, House Majority Whip Kevin McCarthy, and Ann Romney. She faces incumbent and experienced politician Jim Matheson, who has served for six terms. Love favors eliminating the Department of Education and the Department of Energy, and favors returning health care to the states. With these ideas, she is in line with Republican presidential nominee, Mitt Romney, also a Mormon. She is pro-life and has been endorsed by the Susan B. Anthony List. She supports domestic energy exploration, local control of education, Second Amendment rights, and state control of public lands. Love wanted to diversify the Mormon presence in Washington, D.C. Harry Reid is a Mormon Democrat. There are several Mormon congressmen and senators, and Mitt Romney is the proverbial white, successful Mormon businessman. But Love is a Black Mormon wife and mother with a no-nonsense vision for government. She is the first Black Republican woman in Congress and adds to the nation’s impression of what Mormons are really like.